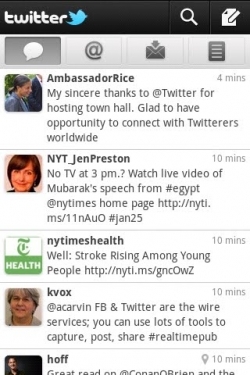 Twitter 2.0 for Android available now | Android Blast! Twitter for Android has been upgraded to version 2.0. The new version has a revamped design and new features. Twitter announced the update on the company's blog. "Today, we’re launching a new version of Twitter for Android. It looks and feels more like our other official Twitter applications and provides a more consistent experience across platforms and devices." When you first sign in, you’ll see your timeline, along with icons along the top that let you view @mentions, messages, and lists.